2011 Aug Phuket Longstayers Association of Judicious Aged members (PLAJA) inaugurated. Dec Safety measures division set up and operating. The 7th Memorial Service of Indian Ocean Tsunami Victims sponsored by PLAJA. 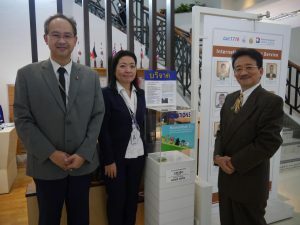 2012 Mar The application agency business to the Embassy of Japan in Thailand started. Nov Dispatches the volunteer insturactor to Phuket Kendo Club. Dec The 8th Memorial Service of Indian Ocean Tsunami Victims sponsored by PLAJA. 2013 Apr The second period of HR report. May The operation of PLAJA logo and website started. Prototype of Cooking Class for Thai people started. Jun The support of the prizes for the monthly tournament of Phuket Kendo Club started. Lunch support activities to Child Watch Home started. Aug The start of the operational emergency alarm system using a smartphone. Merged with the meeting of the Indian Ocean tsunami victims bereaved families. Oct The start of the test service shopping shuttle bus. Nov Thai Language Class started. Dec The 9th Memorial Service of Indian Ocean Tsunami Victims sponsored by PLAJA. 2014 Jan Start the installation of the donation boxes for The Memorial Service of Indian Ocean Tsunami Victims. Feb English Thai Conversation Club started. English Conversation Club and Thai Language Class are integrated. Dec The 10th Memorial Service of Indian Ocean Tsunami Victims sponsored by PLAJA. 2015 Apr The third period of HR report. Refurbishment of PLAJA logo and website. Sep Approved as a General Incorporation PLAJA.